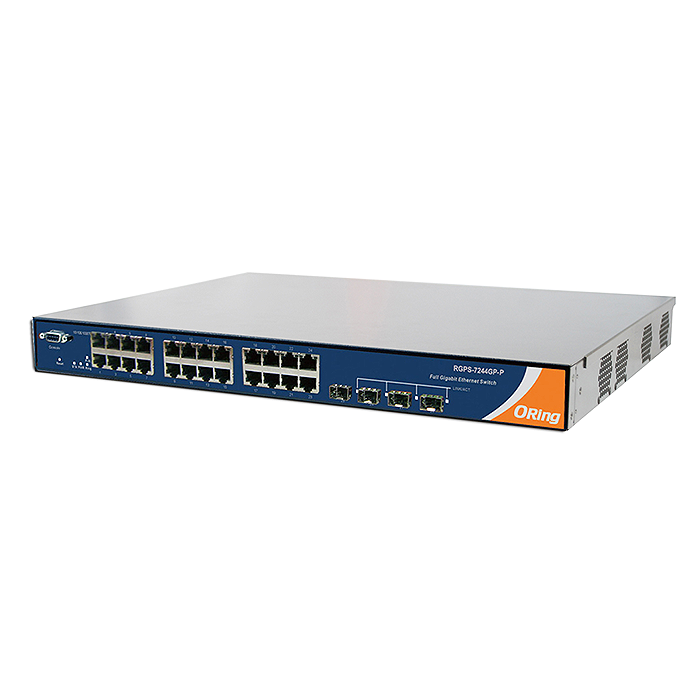 The RGPS-7244GP series consists of managed Redundant Ring Ethernet switches with twenty-four 10/100/1000Base-T(X) ports with PoE (P.S.E.) function and four 1000Base-X SFP ports. With complete support of Ethernet Redundancy protocol, O-Ring (recovery time < 30ms over 250 units of connection), Open-Ring, and MSTP/RSTP/STP (IEEE 802.1 s/w/D) can protect your mission-critical applications from network interruptions and temporary malfunctions with its fast recovery technology. 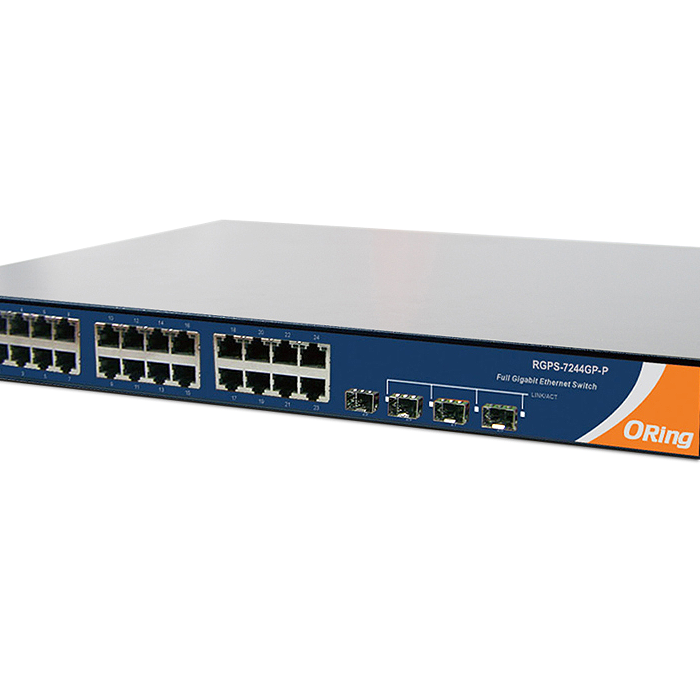 Included is O-Ring’s thunder switch series which provides advanced IP-based bandwidth management which can control the maximum bandwidth for each IP device. Users can easily configure the bandwidth levels of IP cameras and NVRs. This series incorporates application-based QoS, enabling control over data stream according to the TCP/UDP port number. Its IP police function only permits allowed IP addresses with MAC address to access the applied networking, meaning that hackers and other risks are blocked from accessing the IP surveillance network. This function totally prevents hackers from stealing video privacy data and reaching the IP camera, NVR, and controllers. In addition to these features, is an advanced DOS/DDOS auto prevention function. If there is any IP overflow, the included ORing thunder switch will lock the source IP address to prevent the attack. It’s a hardware based prevention so that it can prevent DOS/DDOS attacks noth immediately and completely. The RGPS-7244GP series of switches also uses Power over Ethernet, a system to transmit electrical power up to 30 watts, along with data, to remote devices over a standard twisted-pair cable in an Ethernet network. All functions of an RGPS-7244GP series Ethernet switch can be managed, centralized, and made convenient by a powerful windows utility — Open-Vision v3.0 and above. These switches are ideal for highly managed and Gigabit Fiber Ethernet applications with PoE function. 1000Base-X SFP Port Indicator Green for port Link/Act.